Undoubtedly, the world faces serious challenges in recent times concerning future energy sustainability and security. In order to transform the “dangerous” path of the energy and environmental conditions thus far, it is widely accepted that the most crucial role is to be played by accumulation of knowledge that can be converted into technological progress and innovation . The energy sector globally depends highly on new technologies – more particularly, innovations in the generation of energy and exploitation of renewable resources as well as energy efficiency improvements. With this in mind, investment on research and development (R&D) activities can become a catalyst to reduce the impacts of greenhouse gas emissions and mitigate climate change [2, 8]. Internationally, policy makers are increasing evaluating environmental policies by examining the energy innovation processes. For example, the SET-Plan, European Union’s package of climate and energy reforms is founded on a technology plan . Fernandez, et al, has shown that energy R&D has a positive impact in reducing emissions for developing countries. They also explain that “R&D spending can be recommended, not only as an engine of economic growth of any economy, but as a driver of sustainable development, where growth can be reconciled with lower CO2 emissions” . At the same time, R&D activities have the potential to improve a country’s human capital and create awareness concerning energy and environmental issues encountered in the world. Is just increasing the investment in R&D in the energy sector enough to make vast differences in the current path? A first and quick answer is that indeed new and innovative technologies, produced through R&D, will – always and under all conditions – improve the countries’ energy sustainability and security, economic growth and development, and environmental consciousness. We depend on technological progress, after all, to fast track to the future. 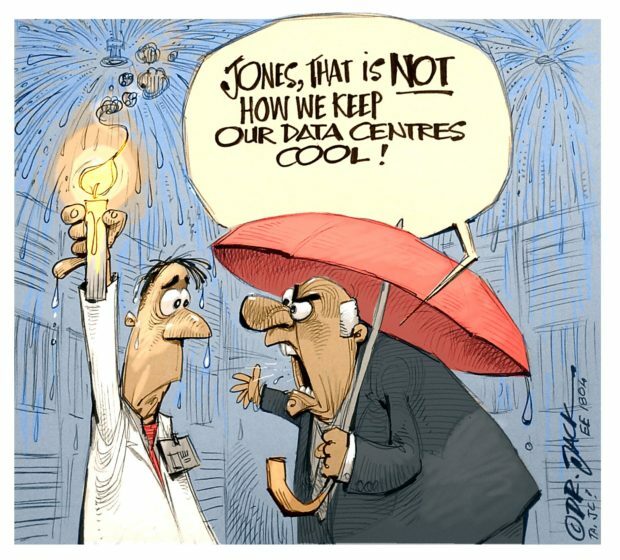 Indeed, the desired outcome of investing on R&D will improve the sector’s conditions. But the link between investment on R&D and successful outcome is not always productive. My current work in progress advocates that looking at energy R&D funding (in monetary terms or share to total) is a good indication of political will. But what will make a difference in the actual production of research outputs is R&D intensity (ratio of energy R&D to GDP), as a measurement of the importance of the sector in the overall R&D environment, and R&D rate of return (number of research outcomes per unit of R&D expenditure), as a proxy for the return on investment. The paper, examining the top-ten countries in energy-related research production, finds that during periods of high research productivity, the R&D intensity and return effects are positive contributors to changes in the energy-related research output. Therefore, it is not only how much is invested in energy R&D but also, how much relative to the country’s economic size and what is the productivity of every unit of investment. Looking within the energy R&D allocation, “Throwing money in a single bucket” without planning and monitoring will not yield any results. The specific nature, safety characteristics, resources needed- both financial and human, the potential for commercialization, and the societal benefits yield by these technologies are important factors for supporting and prioritizing their development. For example, Inglesi-Lotz examined seven different categories of energy technologies and their social rate of return for the G7 countries . The analysis concludes, for example, that investing in the R&D of energy efficiency promoting technologies yields positive societal returns, while that on fossil fuels negative. The rest of the energy technologies’ social rate of return varies from statistically non-significant to various magnitudes of positive or negative values, demonstrating that a one-fits-all policy would not work internationally. Fig. 1 shows that economic development is a priority in an R&D investment portfolio but its proportion has decreased from 62,3% in 2005/06 to 52,3% in 2014/15, almost ten years later. Fig. 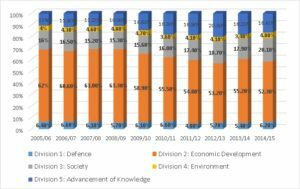 1: Proportional R&D expenditure by socio-economic objectives, 2005/06 to 2014/15 (DST, 2016).The “Environment” category has not surpassed the 5% ceiling through the years. To focus more on the energy R&D, Fig. 2 shows the evolution of the sum of energy-related sub-categories “Energy resources”, and “Energy Supply”. Fig. 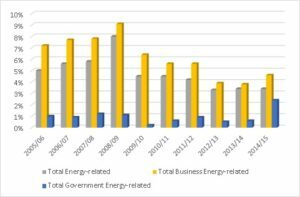 2: Proportional R&D expenditure energy-related sub-categories “Energy Supply” and “Energy resources” (Total, Government and Business sector). A steady increase from 2005/6 until 2008/09, with a peak in the last year of this period, and a “collapse” almost to half from 2009/10 onwards. The same trend is picked up in the business sector’s energy-related R&D expenditures’ share. The government sector is an “outsider” here: the share of Energy-related to total Government R&D does not surpass 1,2% from 2005/06 to 2013/14, reaching 2,4% in 2014/15, showing clearly that energy-related R&D is not in the priorities of R&D for the government. The results pick up a crowding out effect here: as they show a share to the total R&D expenditures, they demonstrate reshuffling of funds from other energy-related to other sectors, and there is no inference as to whether R&D expenditures have decreased or not through the years. Incidentally, this decrease falls within the problematic years in the South African energy sector (since the load shedding crisis in 2008/09, the price restructuring since then and the Eskom adventures). One would expect that a crisis would make the need for posing and answer the right questions more imperative than ever. At the same time, however, in times of budget constraints and political turbulence, other priorities in the agenda are overpassing the creation the knowledge and promotion of new technology development. Is South Africa, though, following global trends? Fig. 3 shows the share of energy R&D to total R&D for selected countries (with only criteria for inclusion the availability of data within the OECD dataset and their level of economic development). South Africa’s share of energy to total R&D is definitely not an outlier – just to note here that Australia’s data is from the year 2008, and hence before the financial crisis, while all the others after. Fig. 3: Share of energy R&D to total R&D for selected countries, (OECD Dataset, 2018). Globally, both developed and developing economies face serious challenges concerning their energy sustainability, environmental performance, and effects to the population’s development. The dangerous consequences of climate change have made imperative for policy makers to decide not only on how to change the current conditions, but also act timely. To do so, the global technological progress can play the most crucial role to reduce the impacts of greenhouse gas emissions and mitigate climate change. Policy makers need to comprehend deeply the mechanisms and incentives to use in order to promote technological advancements in the energy sector. More specifically South African will be greatly benefited from examining these issues and be in the forefront of energy technologies research and development. South Africa tends to show less interest in energy R&D both the government and business sectors, demonstrated in the low shares of energy R&D compared to the total through the years. The sector is dire need of local innovations and development of technologies; however, policymakers should be careful in the quality of R&D and the return of the investment, in order to become leaders in the continent and the world. Finally, to conclude, I would suggest a “P” is added to the acronym for Productive –investing in R&D just for the sake of investing is not enough; it is a waste of financial, human and capital resources and a definite mismanagement of funds that could have had better societal benefits if invested in another sector. Secondly, I would suggest a “D” in the acronym for Dialogue, to promote debate and engagement of the various stakeholders in order to unearth appropriate energy technologies where potential opportunities for innovation are hiding. Efforts to engage stakeholders from all spheres of the energy sector debate on critical issues should be encouraged and promoted. Only then, the right questions will be posed and appropriate technologies will be developed. R Bointner: “Innovation in the energy sector: Lessons learnt from R&D expenditures and patents in selected IEA countries”, Energy Policy, 73, 733-747, 2014. MT Costa-Campi, N Duch-Brown and J Garcia-Quevedo: “R&D Drivers and obstacles to innovation in the energy industry”, Energy Economics, 46, 20-30, 2014. “Statistical Report 2014/15 South African National survey of Research and Experimental Development”, South African Department of Science and Technology, 2016. European Commission: “A European strategic energy technology plan (SET Plan) – towards a low carbon future”, Communication from the Commission to Council, the European Parliament, the European Economic and Social Committee and the Committee of the Regions, COM (2007) 723, Brussels, 2007. Y Fernandez and MA Lopez: “Innovation for sustainability: The impact of R&D spending on CO2 emissions”, Journal of Cleaner Production, 172, 3459-3467, 2018. R Inglesi-Lotz: “Social Rate of Return to R&D on Various Energy Technologies: Where Should We Invest More?”, A Study of G7 Countries, Energy Policy, 101, 521-523, 2017. “Gross domestic expenditure on R&D by sector of performance and socio-economic objective”. 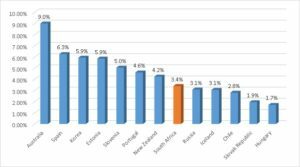 OECD Stat, data extracted at 17:27 UTC on 23 May 2018. D Popp, RG Newell and AB Jaffe: “Energy, the Environment, and Technological change”, Working paper 14832, National Bureau of Economic Research, Cambridge, MA, 2009.